And he liked Ford V-8s, Buck Jones, Aunt Grace’s baked beans, Ruskin Park, Winchester rifles, Colt six-shooters, Stetsen hats, Hieser and Fred Mueller saddles, Northern Plains Beaded Indian goods, beefsteak, rhubarb pie, and hunting jack rabbits. 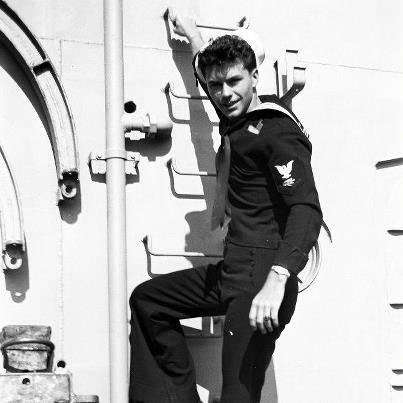 He volunteered for the Navy in 1943. Assigned to the USS Missouri, Battleship 63, as a radio operator, the ship was the site of the Japanese Surrender Ceremonies in Tokyo Bay, September 2, 1945. Bob married Norma Schwabauer in 1948 and graduated from the University of Wisconsin in 1951 where he was a laborer in residential construction and on the GI Bill. His major, American Institutions, included studies in Geography, History, Political Science, Anthropology and Economics. 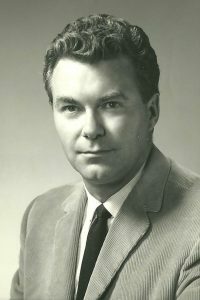 He started his insurance career with O’Rourke and Daniels in Denver and with his wife raised four children in suburban Cherry Hills Village. With the support of his parents and wife, he founded The High Country Corporation in 1955, which specialized in surplus lines and high-risk casualty and property insurances. He sold his business in 1979. 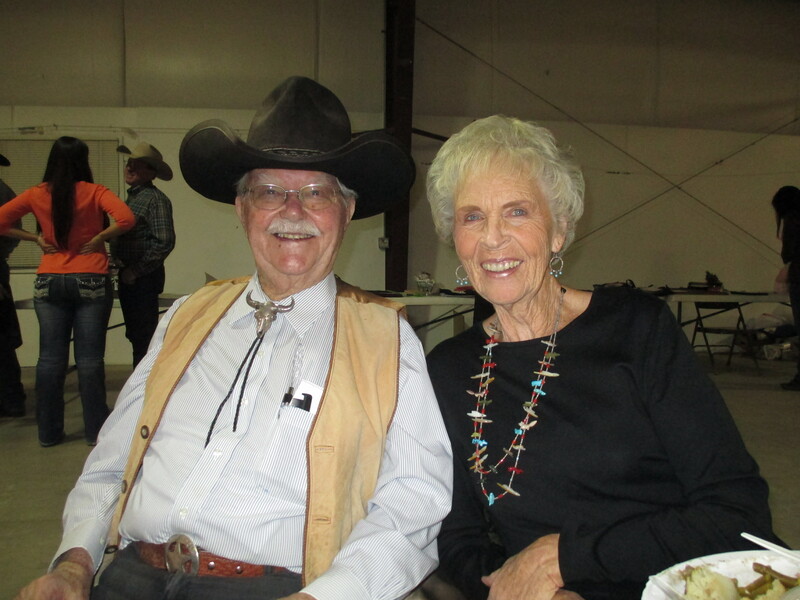 The second half of his life was invested in being a Douglas County rancher. 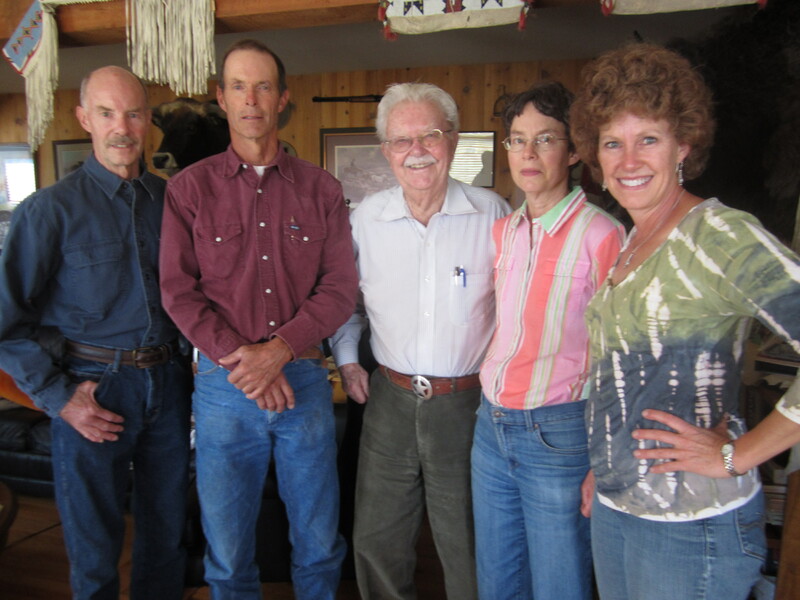 His Colorado ranch, Prairie Canyon, is dedicated to wildlife, open land, and western history. 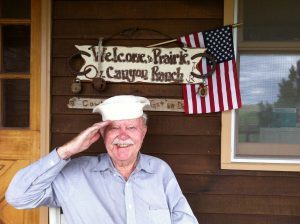 Sold to Douglas County Open Space in 2000, his desire was for the ranch to remain undeveloped and open to horse back rides, hikes, picnics and historical tours. 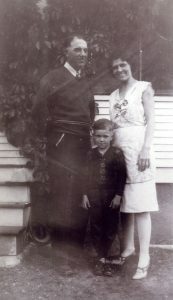 His hometown affiliations were Dunham Historical Society, Kiwanis Club and the American Legion. In Colorado his memberships included Round Up Riders of the Rockies, the Denver Westerners, Farm Bureau, Douglas-Elbert Livestock Association, Texas Longhorn Breeders Association of America, National Cowboy Hall of Fame, American Battleship Association, Parker Breakfast Club and Franktown Power Brokers, and the Republican Party. 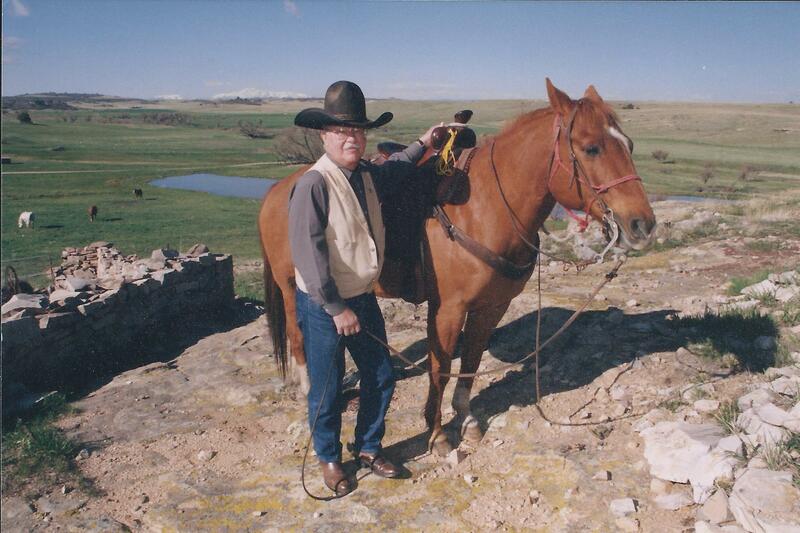 He was instrumental in having Eagle Woman inaugurated into the South Dakota Hall of Fame in 2010. He recognized and admired her place in history and was proud to have her acknowledged in this manner. 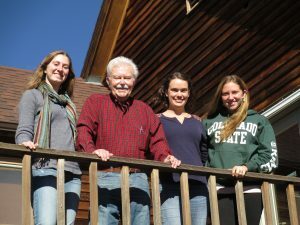 In later years, four granddaughters, Staci, Ashley, Summer and Liberty, became his priority. 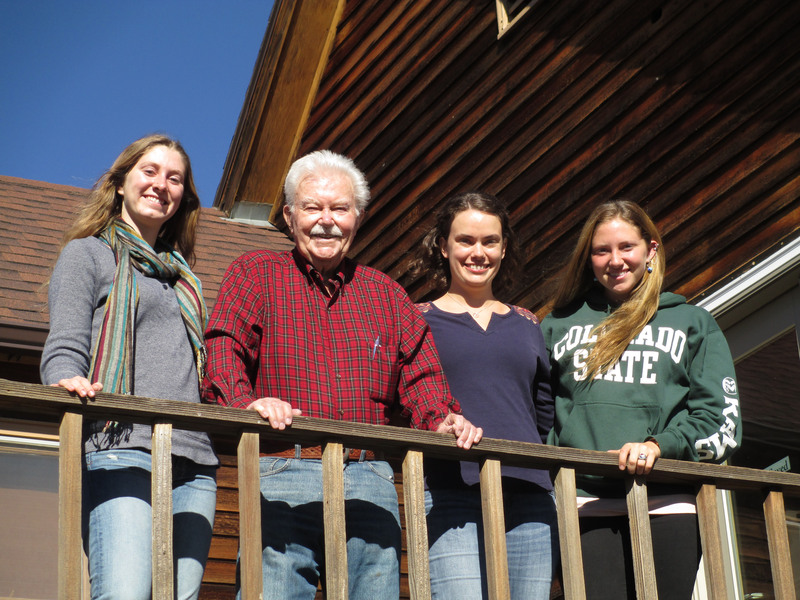 They and his two daughters were his primary reason for staying in Colorado. In March of 2015, he became a Great Grandfather to Irelyn Shultz Griffin. 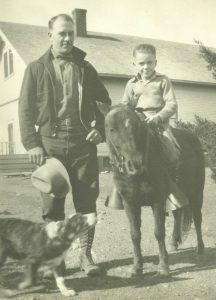 He liked Blue Corn Horses, tongue and cheek humor, and wearing spurs in the town watering hole. He loved to read about the history of the 1800’s, especially The Battle of Little Big Horn and the lone survivor, a horse named Comanche. His favorite writers were Mari Sandoz, Frank Dobie, Will James, Ayn Rand, and Ben Greene. Favorite persons included Aage Madsen, George Bridge, Hugh Glass, Thomas Jefferson, Buck Jones, Tom Mix, Crazy Horse, Eagle Woman, Will Rogers, Buster Keaton, Charley Russell, R. J. Payne, Barry Goldwater, Milton Friedman, Mike Rosen, and John Elway. His favorite vacation spots were San Diego, Jackson Hole, Vancouver, BC, Santa Fe, London, Ft. Laramie, and Western Nebraska sandhills. His favorite motion picture was Casablanca. His last cow pony was quarter horse Gambler, who would ground tie, (retired to Turtle Peak Ranch), and his last blue heeler, Buddie, is buried at Bartruff Cemetery, Prairie Canyon Ranch. He enjoyed the company of two cats, Mama Kitty and Peanuts, who gave him great comfort and companionship in his 80’s. In his last years, he enjoyed the company of friend Carol Gummersall and regular visits from his daughters Lindy and Lisa as well has Tom Wickland. His view of Pikes Peak and the open space of Prairie Canyon Ranch was a site to behold from his dining room table. Please feel free to leave comments of memories of Bob Shultz. Click here for a shorten obituary. I am sorry for your loss. Bob had a fine and rich life. I too will miss him. A beautiful tribute. 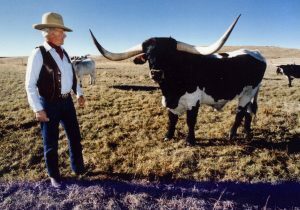 Fitting to such a powerful soldier, father, businessman and rancher. He lived what we all call our history. Especially loved to hear the SD connections. Nice to see your family’s sharing heart as the ranch will live on in the open space program for generations. May your beloved memories comfort you through Robert’s passing. What a beautifully done tribute. Thanks for sharing. We always enjoyed seeing Bob while volunteering for DC Open Space, hearing his stories and watching him feed “cookies” to the Longhorns, also as a librarian I often saw him at P. S. Miller Library. So sorry for your loss. Oh, Douglas County will miss Bob! 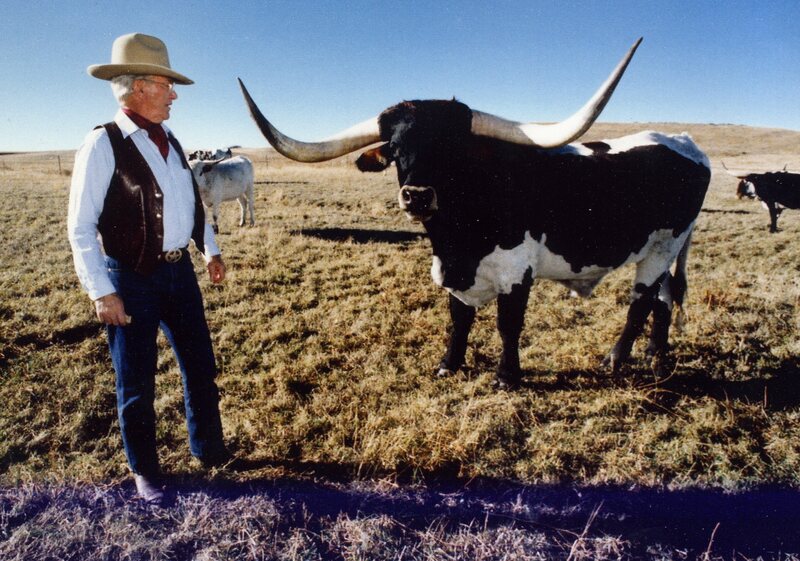 I remember leading the field trips of kids onto PC Ranch and Bob appearing at some point to talk with them. Oh, the questions they would ask and the stories he would tell. Can’t help but have a smile on my face thinking about him. 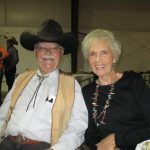 Lindy has lovingly told stories about Bob over the years and how much she enjoyed being with him on the ranch. Still I was not prepared for such a powerful life story. Reading his obituary made me laugh out loud one moment and weep the next. What an extraordinary man!! 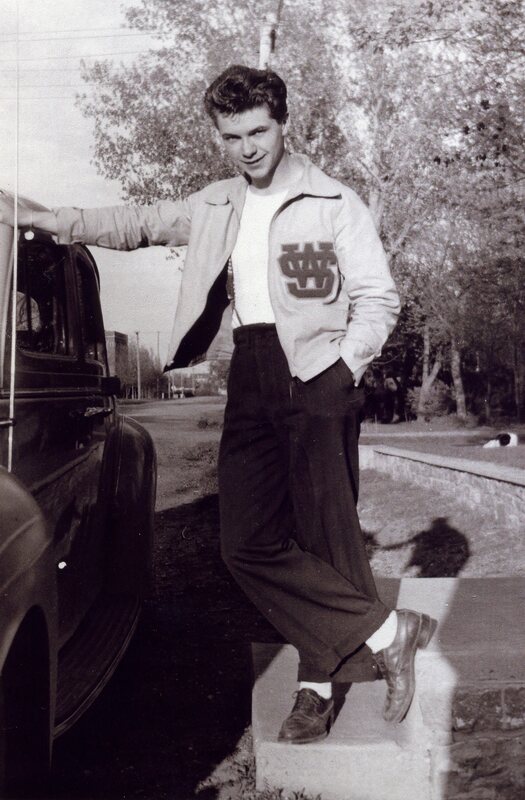 Knowing him would have been very special, but, Lindy, you have been blessed beyond words–a legacy to treasure. I will miss Uncle Bob. He was what one would call a “character”, since like his father, he didn’t always do the expected! Totally unpredictable, except always interesting. My first memory of him was when he gave me a ride around Wessington Springs in his Black 1940 Ford convertible (I suppose I was 3 or 4 years old). 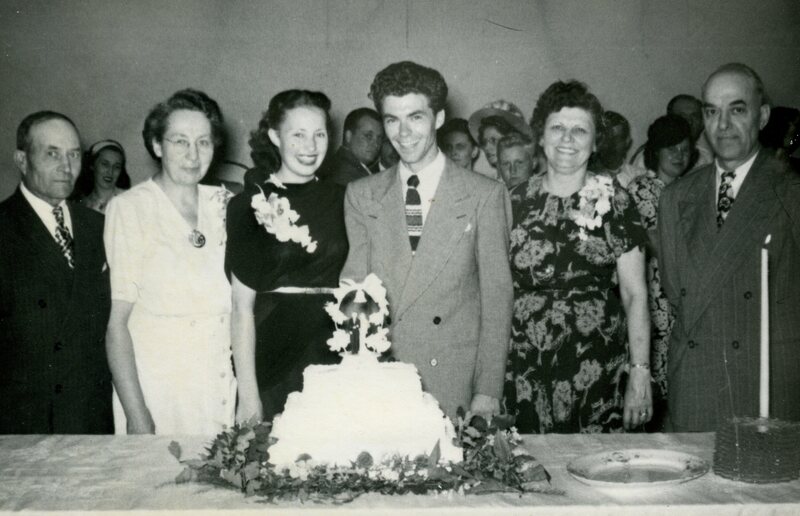 Next was when Bob, Norma, and baby Rob moved from Wisconsin to Denver: They stopped in WS to see the family, and in the middle of a snow storm, Bob turned too sharply at the corner and dropped to wheel of the trailor house into a ditch. My Dad, Grandpa Schwabauer, and Bob worked for hours in the cold to free up that trailer. There are many other memories, of course, so that Bob will live on in our minds and hearts forever. Our sympathies to the entire Shultz family. Thank Keith for sharing your memories with us! I’m so sorry to hear of your father’s passing. Our thoughts and prayers are with you. He was one of my favorites and I had the good fortune of seeing him several times over the years both in Colorado and in California. I’m so glad you shared the video. It’s wonderful to see him and to hear his voice. I will miss him deeply but I know my life is richer for having known him. This is a beautiful tribute to your dad, Lisa. It would be a different world today if every child honored their father the way have done so consistently, and if every father led such an honorable life. It is obvious that he was a man full of adventure and vigor, much like yourself! Gentle Peace. I really enjoyed this tribute to Bob. He worked with our office (NRCS) quite a bit in the 90’s and 2000’s doing several conservation practices on his property. Always enjoyed going out there and visiting with Bob and listening to his stories about the ranch history. 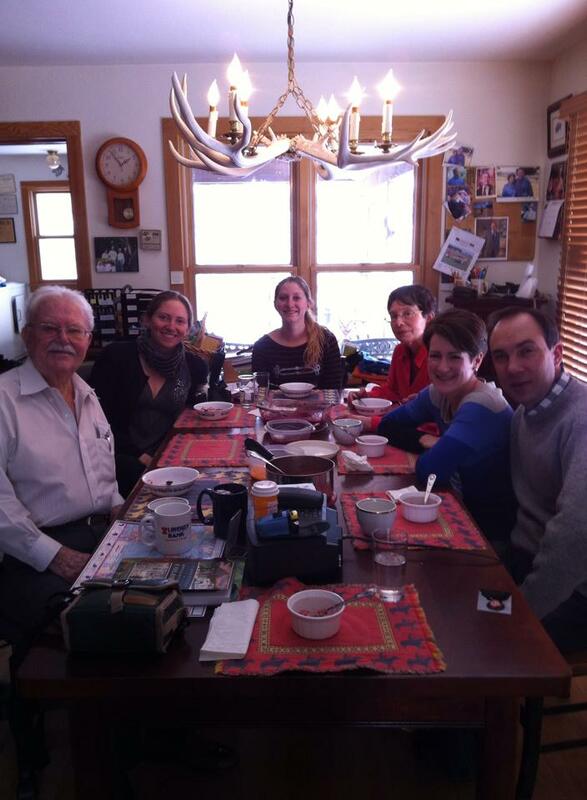 He always invited me into his house for a cup of coffee and showed me all the artifacts he had found. He was a real character with a great sense of humor and a real asset to the community. We will really miss him! Thank you for sharing Dan. We have wonderful Longhorn related memories of Bob. We enjoyed the weekend he had Ron judge a sale and we were allowed to stay in the “bunkhouse” and roam his ranch. We had so many laughs with him. What Ron didn’t come up with, Bob did. That hat,,, oh that hat..
Kori and I are so sorry for your loss. I’m sure Bob and Ron are out “Checkin the cows” together and debating which one owns the best herd sire. Lisa, I didn’t know your dad, but this beautiful obituary makes me wish I had. Great job Lisa in telling so much about Uncle Bob and his life. I really enjoyed the video also!! I will miss Uncle Bob so much. Loved him and shared a lot of good times.